Map intended for Use Map Settings for 3vs3 North-West vs North-East. Double-Wide ramp & staircase to enter main base. Must 'gather' through egg on small ramp to scout. 12 o'clock island expand can be entered by killing neutral building. I created this map after falling in love with playing on Cardinalallin's map's "Red Heart", "Lloyds Beacon", and "Dyad". Thanks for the compliment. Looks fun. I have a half finished map a bit like this that I havent posted here but did playtest a bit. This map is better than mine in some ways though. I like some of the shapes of the terrain, paths, and battlegrounds that you have made. Seems like red has 2 gas in the picture, you probably fixed this already though. An easy win would be to make the town hall spots prettier rather than just a block of 4x3 white tiles too ofcourse. And those inverted rusty pit ramps could be altered. See (2)Oxide for vertical ramps that could be used if you change the terrain a little. This map is geared more to the late game, players can quite easily get several bases (and there are 10 mineral patches in the mains etc). So it plays very differently to the half finished map of mine I mentioned which is lower econ/slower buildup style gameplay. The most important thing that needs thinking about; it looks like there is not enough building space for 3 players in the mains. You could just turn it into a 2v2 map instead. Or you could turn the natural into a single expansion in order to make the mains bigger. Two minor things: the map currently has large areas of black solar array terrain which makes lurkers stronger. Not necessarily a problem, just something to consider. Also the map currently has lots of mineral formations with 'buckets'. eg the high ground expansion in the bottom left and bottom right corners. These mineral formations make splash attacks stronger, able to kill lots of workers (eg storm drop). 2 minor things that are easy to change if desired. Yeah, good stuff, glad to see. btw MellOw[PaiN] you mentioned 'redheart', but you still havent told me have you tried out (6)Redheart Bridge in particular yet? MellOw[PaiN] whats your teamliquid account name? Happy to see all the activity recently too, Darkstar your map concepts are looking great. Good to see SiaBBo and jamssi, Clipse and everyone posting maps! and Spore, Lyra, Starparty etc in the forums again. 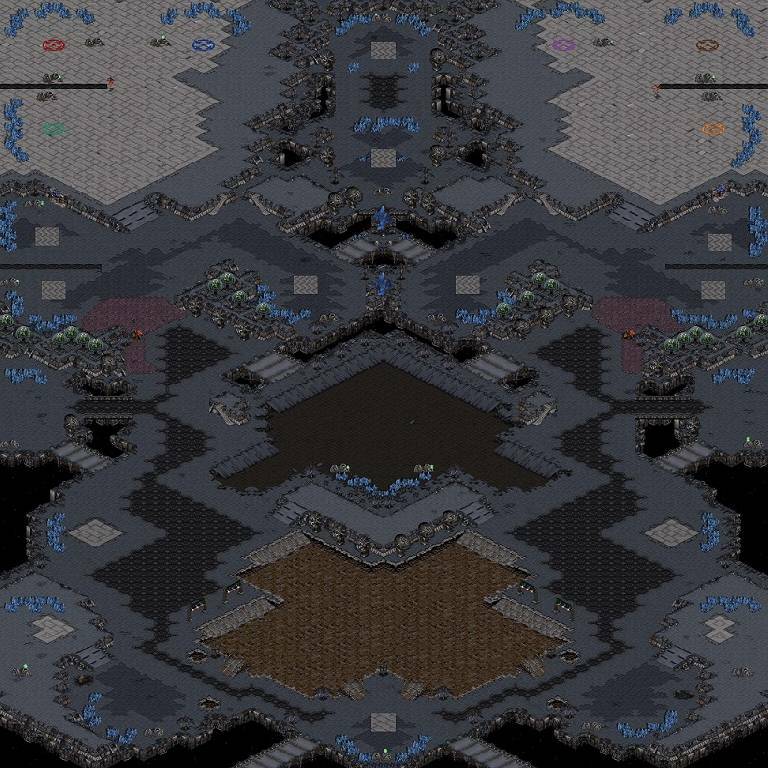 @Clipse are you the sc2 mapper 'IIEclipseII' ? @Jungleterrain Im here everyday Im just not posting much this year. You should not use Elevated Catwalk ramps (high ground) for Rusty Pit (low ground). Overall you show a lot of disregard for terrain levels. There's an overlay in ScmDraft to show you which tiles have which terrain levels. No, I've always used this tag and haven't made many SC2 maps.